Old Smithy [NN00NE 93]. 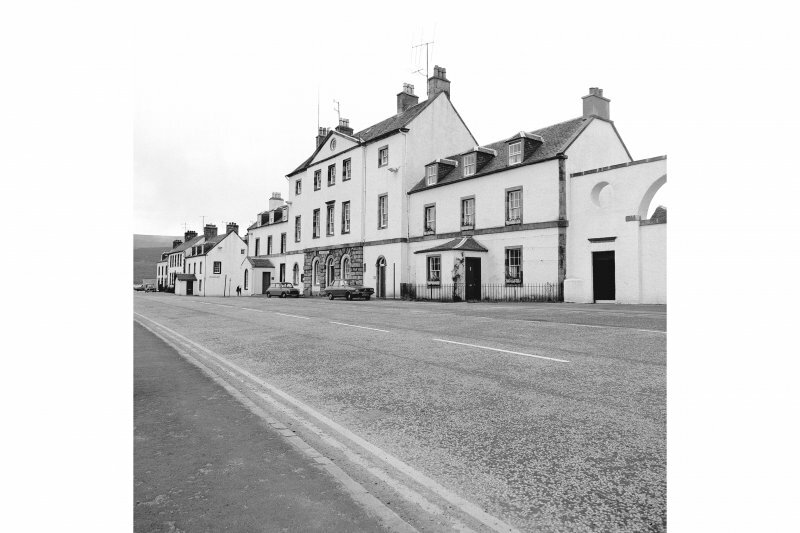 Two semi-detached buildings, having a combined six-bay 20.5m frontage facing E along Front Street, situated at the edge of Inveraray Castle Policies between the main lodge (see No. 185) and the Dalmally Arch. They are 1 1/2-storeyed in height, each having two dormer windows which, like the main roof, have sprocketed eaves of late 19th-century character, and the N building has an added porch. This building was erected in 1752 as a bakehouse, and a large brick-built oven in an outhouse against its N gable was demolished about 1959, while the S half was added in 1772 as a house for the estate blacksmith, with an adjacent yard, including the smithy, to the W. The buildings are now occupied as a shop and tearoom. Dalmally Road Arch [NN00NE 47] (A on fig.). This archway, which was designed by Robert Mylne and built by John Tavish in 1787, spans obliquely the space of 12.4m between the SE angle of the smithy and the NW angle of the Argyll Arms Hotel (No.203). It comprises a central opening 4.3m wide and 5.8m high across the A819, the former military road to Dalmally (No.269), with a pedestrian arch 1.8m wide and 3.3m high at each side. The main arch resembles that of the avenue screen(infra), with small sunk roundels in the upper spandrels, a moulded cornice and a blocking-course, but the rectangular piers are narrower and have moulded imposts, continuous with the slab-cornices of the side-arches which carry stepped blocking-courses and have similar imposts. Avenue Screen [NN00NE 42] (C on fig.). This screen, similarly designed by Mylne and completed by Tavish in 1787, spans the space of 39m between the Argyll Arms Hotel on the N and Ivy House on the S. Mylne's earlier projects of the 1780s include one with two additional houses separated by metal railings with a central gate to the avenue, another having a screen-wall with a central arch surmounted by an obelisk, and the final drawing shows the screen almost as built.! It comprises a wall6m high pierced by five segmental-headed arches which are3.8m wide and 5.5m high, except for the central archway. This measures 4.2m by 5.8m and is set in a slightly advanced centrepiece with a moulded cornice carrying a blocking course. These details are of chlorite-schist ashlar, as are the plain slab-copings of the screen, the impost-courses, continuous at the S with the first-floor band of Ivy House, and the moulded cornices set 0.3m above the heads of four doorways in the respond-piers and the adjacent piers. The spandrels above these doorways are pierced by roundels 1.3min diameter, and the spandrels of the central arch have small sunk roundels like those of the Dalmally Road Arch. The three central arches have iron double gates with concave tops, as shown for the central one only in Mylne's drawing, and each of the outer arches contains a window, that to the W lighting a single-storeyed lodge which was designed by Mylne. This is now used by the Argyll Arms Hotel and has been much altered. The doorway at the E end of the screen led into the garden ground attached to Ivy House, immediately E of the avenue wall, but an outhouse matching the lodge was added in the 19th century. Ivy House [NN00NE 46] (D on fig .). This house, situated immediately of the avenue, was one of a pair designed by John Adam in 1750 to flank the Town House (No. 209), and built by George Hunter in 1755-7. It has a three-bay 12.2m N front, with schist-ashlar quoins, cavetto eaves-course, skews and chimneystack on the W gable and a plain ashlar band at first-floor level continuous with that of the Town House. Dormers are shown on Mylne's drawings of the 1780s, but the existing ones, and the central porch, appear to be of 19th-centurydate. Mylne shows rusticated doorcases here and at the matching Chamberlain's House, which resemble that of Alexander MacPherson's house of 1756 in North Main Street, but no traces survive and the surround of the 1.22mwideinner doorway is not exposed. The house, which remains in private ownership, was not modernised in the 1950s and it retains original fielded shutters and doors and moulded plaster cornices. Its layout is close to that shown by Adam in 1750, although the central geometrical timber stair was built further to the rear, leaving a larger entrance-lobby. This stair was remodelled in the 19thcentury but its lower flight retains an original handrail with a scrolled lower terminal. There were two main rooms on each floor, the W ground-floor room, now modernised, being the kitchen. The W room of the first floor has a modillioned cornice, and each room has a mural cupboard in the gable-wall. At the N end of the E wall there is an additional cupboard with an 18th-century door, containing two steps, which was evidently the opening into the Town House that Archibald Campbell of Danna, Sheriff-clerk and then occupant of the house, was given permission to 'strikeout' in 1773 (see No. 209). The fireplaces throughout have been modernised but those in the E wall, which is the E end wall of the Town House, are served by a chimneystack surmounting its gable. The fireplaces in the two rooms at garret-level have been removed, but the rooms retain 18thcenturydoors with two fielded panels. Chamberlain's House [NN00NE 77](F on fig.). This house, situated at the NW angle of Main Street and built against the E gable-wall of the Town House, was designed by John Adam as a mirror-image of Ivy House, except for the clockwise rise of the stair. To the E, where the ground slopes away, it is built on a substantial base-course. Its porch, with round-headed N window, was built in 1783 and is shown on one of Mylne'sdrawings.2 From the last quarter of the 18th century to about1950 this house, with the adjacent one at the N end of North Main Street, were the residence and office of the Chamberlain of the Argyll Estate. Its interior was extensively altered, the stair having been replaced by a central corridor to the adjacent house before Lindsay's restoration, and there are no surviving original features. Former Manse [NN00NE 71] (G on fig.). This building, at the NE angle of North Main Street, was planned by Robert Mylne as one of the manses for the two ministers of Inveraray, and built by the mason John Brown in 1776. With the other manse (infra) it flanks a larger central house built in 1759-60, but unlike the Adam houses flanking the Town House, these have their own end-walls surmounted by chimneystacks matching in height those of the central house. Mylne's drawings of the 1780s include a proposal to heighten all three buildings to three storeys, and another to give the manses hipped roofs and heavy cornices continuous with that of the central house, but they retain much of their original simple design, except for the addition of a 19th-century porch to the W manse and dormers to both. The three-bay 11.8m N front, which is setback 0.3m from the adjacent house and has a wall-head 1.2mlower, has vertical NW quoins, an eaves-course, and sharp-arrised window-dressings of grey schist-ashlar, presumably the St Catherines stone from the demolished Physick Well (see No. 185) which was re-used in the manses. The W gable has ashlar skews with slight horizontal returns, and an ashlar chimneystack, and the three windows in this wall, facing North Main Street, have 35mm chamfered surrounds, possibly re-used from the Old Town. The building was occupied for many years until the 1960s as a temperance hotel and is now divided into two flats, the upper one reached by an external stair at the rear and both totally renovated. Gillies's House [NN00NE 45] (H on fig.). This house of two storeys above a cellarage, with a five-bay 12.9m N front, was built in1759-60 for John Richardson, the merchant for whom the nearby large house, now the Fernpoint Hotel (No. 207), had been built seven years earlier. Richardson had obtained from John Adam plans for a freestanding house of somewhat similar lay-out but with a projecting central bay (en.3), and Adam probably designed the present building whose lease was sold by Richardson to Captain Neil Gillies, a mariner, even before its completion. A broad ashlar band runs below the door, which is raised about 1m above street-level and is approached across a narrow area by three moulded stone steps with iron balustrades. The rusticated angle-quoins, moulded eaves course and window- and door-surrounds are of chlorite-schist ashlar, the doorcase having a semicircular-headed rusticated surround enclosing a simple radial fanlight. The rear elevation is also harled and whitewashed, and has a central circular stair-tower entered by a ground-floor door on the E. Low doors in the rear wall give access to the two cellars which are divided by a transverse wall; the E cellar contained an end-wall fireplace, now blocked. The upper floors each contained two main rooms, with smaller rooms behind, divided by central lobbies, with an additional small centre room on the first floor, but they were altered in 1960 to form two flats. Some six-panelled cupboard-doors and fielded shutters remain in situ, and on the ground floor there is a cupboard with massive steel doors and stone shelves dating from the use of the house as a bank in the 19th century. A 1 1/2-storeyed three-bay stable measuring 13m by 6m stands parallel to and 6.5m S of the rear of the house. It is built of granite rubble incorporating some dressed stones in re-use, and at the NW angle a shaped skewputt of schist remains, although the original skews have been replaced. Former Manse [NN00NE 44] (J on fig.). This building at the E end of the row closely resembles the matching manse of 1776 described above, but it retains its original stone door-surround with rusticated base-blocks and arch-voussoirs enclosing a fanlight like that of Gillies's House. The E gable-skews were replaced with continuous slates in 1960. The two ground-floor windows have been widened to the E and filled with plate glass lighting a shop which has above it a flat reached by a forestair at the rear. Chamberlain's House (A on fig.). The E gable of John 436Adam's building of 1755-7 (No. 201,F), 6.6m in width, contains a single window at each main level, set towards the original SE angle, and a small garret-window in the gable. The three-bay 11m S wing, added in 1775, has large first-floor windows matching that of Adam's building, but the ground-floor windows of both buildings are set high above the street level (the internal floor being raised to compensate for the slope of the site), and the two N windows of the wing are of considerably lower height than the other. The original wing was about 6.6m wide, like the Adam house and its neighbour to the S, but an extension containing the stairs was added in the 19th century. The building is now divided into flats and retains no early features. House (B on fig.). Seven-bay 16.7m frontage, maintaining the same eaves- and ridge-level as the adjacent Chamberlain's House, but containing three low storeys (en.1*). The ground floor has a central door into a pend giving access to the rear, where a modern forestair replaces the former semicircular timber stair that rose from the S side of the pend. The remainder of the ground floor is now occupied by two shops, each with a central doorway between two enlarged plate-glass windows, but it is not certain whether these doors are original. The rear elevation has a central gab let. The original layout of the upper floors appears to have comprised two flats at each level, entered from the front landings of the central geometrical stair, but this was extensively altered in the 1950s.The only surviving feature, in the N gable-wall at first-floor2p level, is a stone bolection-moulded chimneypiece of late 17th- or early 18th-century type, evidently re-used from a house in the old town (No. 199), set in a later timber mantel with three fluted panels. House (C on fig.). Two-storeyed building 0.5m wider than House B and with a four-bay 12.8m frontage, having two modernised shops on the ground floor. The upper floor and garret were formerly reached by a central timber geometrical stair, but access is now by a forestair at the rear. House (D on fig.). 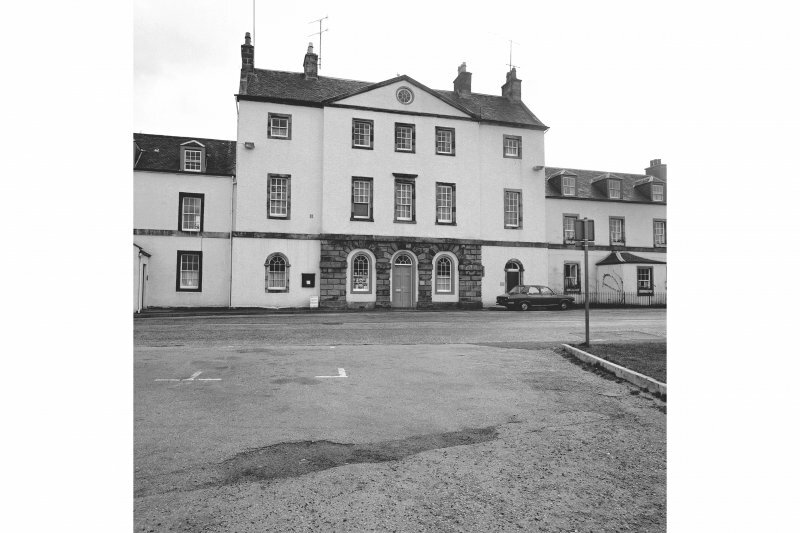 Three-storeyed seven-bay frontage, erected for Thomas Hislop before 1780. A mid-wall chimneystack two bays from the N end was removed about1960, but the position of the wall is marked externally by the spacing of the windows. At ground-floor level there are five doors, that in the third bay from the N giving access to a pend and the others to three shops and an internal house-stair, andt here are also three shop-windows, of which the S one retains its original N jamb. Access to the first floor of the N part was latterly by a rear stair-tower of 19th-century date, which was renewed about 1960, and above that by an internal dog-leg stair, which continues to the garret. House (E on fig.). Two-storeyed building with dormers extending a little below eaves-level which, like the roof-ridge, corresponds to those of the two buildings to the S, despite the fall of the street, so that it is almost as tall as its three-storeyed neighbour to the N. It was inserted, probably about 1780, into the 7.8m space between its neighbours and has two window-bays at each level, with a central doorway and an additional, probably inserted, doorway at the N end. The ground-floor shop-windows have been widened and deepened, but with much of the original masonry of the jambs re-used. MacPherson's House (F on fig.). The earliest house in Main Street, built in 1756 for Alexander MacPherson, merchant, who submitted to the Argyll estate for approval a sheet of drawings, probably by John Adam, for two-storeyed three-bay detached and semi-detached houses (en.2*). As built, however, it is of five bays, 12.6m in length, with rusticated quoins and a rusticated door-surround, a projecting keystone and slight curved lugs above the central first-floor window and a moulded eaves-course, with renewed ashlar skews. There were two rooms, now extensively altered, on each floor, with a central stair-hall at the front of the ground floor and a closet above it. They were separated by an original geometrical timber stair with a narrow open well, simple turned balusters and a moulded hand-rail, which continues to the garret. House (G on fig.). Built for Mrs Elisabeth Campbell of Bragleenmore in 1768, this house presents a three-bay Il.3mE front to Main Street and a S gable to Church Square. A two-storeyed sw wing, having a circular stair-tower in the NW angle, was added early in the 19th century (en.3*) to connect it with a two-storeyed gabled house set parallel to and 4.3mW of the original main block and entered by a rectangular stair-tower on the W. The E front has at the N end a doorway into a pend, and between this and the doorway into the ground-floor shop there are two close-set windows of uncertain age. At the wall-head there is a moulded eaves course continuous with that of the adjacent house of 1756, interrupted by the lower parts of three dormers. The stair tower contains a substantial stone newel-stair, but no other early features are preserved in the interior. Built against the S gable-wall there is a small single-storeyed and gabled storeroom, formerly a workshop and having a small enclosed yard behind it, which is probably of early 19th-century date.